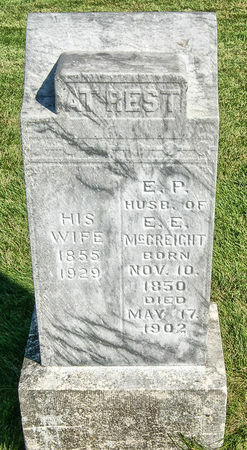 Ephraim Preston McCreight, son of Matthew McCreight and Elizabeth Cummings, was born Nov. 10, 1850 near Tranquility, Adams Co., Ohio and died May 17, 1902 in Tarkio, Atchinson Co., Missouri. He married Ezilla Hale Oct. 13, 1874 at Winfield, Henry Co., Iowa. She was born Sept. 14, 1855 near Winfield, Henry Co., Iowa and died Dec. 5, 1929 in Clarinda, Page Co., Iowa. Her 2nd husband was John Wood.